LG Second Year Promise. Get a free second year of warranty from LG on your new LG V40 ThinQ™. See offer details. 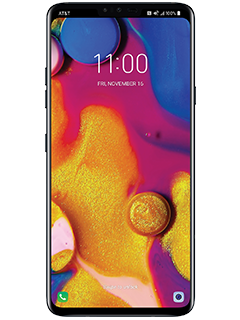 Learn how to get the new LG V40 ThinQ™ for free, plus $400 in credits with trade-in. See details. A 6.4” OLED edge to edge display that offers the most immersive viewing experience ever from LG. Take studio-quality portraits that make you look your best with 5 studio lighting effects, artistic filters, and the Cinegraph app. Automatically applies the best effect and angle and finds an ideal composition when taking someone’s picture. LG BOGO Offer: Limited time. Available in select areas and locations. Requires buying two LG V40 ThinQ (priced up to $949.99) with one new wireless line. Buy each on 0% APR AT&T Next (30 mos. at up to $31.67/mo.) or AT&T Next Every Year (24 mos. at up to $39.59/mo.) installment agreement. Tax on full retail price of both due at sale. After up to $950 credits, get LG V40 ThinQ for free. Req'd Wireless: Postpaid wireless voice & data on both devices (min. $80/mo. combined if new with AutoPay and paperless bill discount. Pay $100/mo. until discount starts within 2 bills.). If you cancel wireless on one, will owe that device balance of up to $950. Activation/Upgrade Fee: $30/each. Return: Return within 14 days. Restocking fee up to $45 each may apply. Add'l BOGO terms for customers w/consumer acct & Subscriber Paid User acct: Buy one device must be on Subscriber Paid User acct & free/discounted device must be on the consumer acct. Billing addresses for Subscriber Paid User & consumer accts must match. Req's elig. postpaid wireless voice & data svc on both devices. Combined min. elig wireless svc is $28.50/mo. on Subscriber Paid User acct + $45/mo. on consumer acct after AutoPay & paperless bill discount. Pay $83.50/mo. until consumer acct discount starts within 2 bills. Bill Credits: Credits start within 3 bills. Will receive catch-up credits once credits start. Applied monthly in equal amounts over entire agmt term & will not exceed $950. Both wireless lines must be on same acct, be on an installment agreement, active & in good standing for 30 days to qualify. Installment agmts start when device is shipped. To get all credits, free/discounted device must remain on agmt for entire term and you must keep eligible service on both devices for entire installment term of free/discounted device. If you cancel service on either line, credits will stop. If you upgrade or pay up/off agmt on free/discounted device early your credits may cease. Limits: May not be combinable w/other offers, discounts or credits. Purchase, financing, other limits & restr's apply. This offer may make your account ineligible for select other offers (including bill credit offers) for 12 months. See store or att.com/LGoffer for offer details. $400 TRADE-IN OFFER: Limited Time Offer. Online and select locations only. Req's purch of new LG V40. Elig. Service: Postpaid svc (voice & data) is req'd (min. $50/mo. for new svc with AutoPay and paperless bill discount. Pay $60/mo. until discount starts within 2 bills. Existing customers can add to elig. current plans which may be less). Elig. Trade-In: Trade-in must be in good working condition. Req's min. $20 trade-in value & meet AT&T Trade-In Program reqmts. Must trade in elig. smartphone at a participating location and complete trade-in within 14 days from the receipt of new phone. This is not an early upgrade program. If purchase at att.com, will get an email after purchase with promotion code necessary to use during online trade-in in order to get the promotional $400 value. Promo code must be used within 14 days. Credit/Promotion Card: In AT&T-owned retail stores, you will receive an instant credit. For online trade-in, must use promotion code and will get a promotion card within 3 weeks after complete trade-in of an eligible device. The card is a Private Label AT&T Promotion Card (“Card”) issued by MetaBank™ or CenterState Bank of Florida NA, via a license from Visa U.S.A. Inc. Instant credit & Card may only be used for AT&T products & svc in AT&T owned retail stores, at att.com, or to pay wireless bill. Card expiration date not less than 90 days from receipt. Dealers: Participating dealers provide savings for use at time of trade-in or a dealer promo card. Dealer cards contain add'l terms & conditions & may only be used at specified dealer. Other Obligations: Trade-in does not relieve obligations under AT&T Next or other AT&T Return and Exchange programs including recently-purchased device returns, Warranty, or Extended Warranty. Devices to be returned through these AT&T programs should not be traded in via this offer. Limit: One trade-in per qual. purchase. Visit a participating store or att.com/trade-in to learn more. GEN. WIRELESS SVC: Subj. to Wireless Customer Agmt (att.com/wca). Credit approval required. Deposit/Down Payment: May apply. Limits: Purch. & line limits apply. Prices may vary by location. Taxes, fees, monthly, other charges, usage, speed, coverage & other restr's apply per line. See att.com/additionalcharges for details on fees & charges. International and domestic off-net data may be at 2G speeds. AT&T service is subject to AT&T network management policies. See att.com/broadbandinfo for details.